Even as the number of Americans without health insurance is at a record low, Chicago hospitals are wrestling with a metastasizing problem: bad debt. These days, rather than struggling to collect payment from uninsured people, hospitals are being stiffed by insured, often middle-class patients who can't—or won't—pay skyrocketing out-of-pocket costs. Advocate Health Care, Illinois' largest hospital network, saw its uncollectible accounts increase more than 22% in 2016, to $269.5 million, or about 5% of its overall revenue. The spike is related to an increase in deductibles and overall patient financial responsibility under today's insurance plans, David Szandzik, vice president of revenue cycle for Downers Grove-based Advocate, says by email. Swedish Covenant Hospital, one of the largest and oldest community hospitals in Chicago, watched its bad debt skyrocket by 71%, to $11.2 million, in 2015, the most recent year for which numbers are available. At Lurie Children's Hospital, bad debt increased 22%, to $11.5 million, in 2015. If a Republican Obamacare replacement bill had passed, unpaid bills would have continued to rise, Szandzik said, citing the nonpartisan Congressional Budget Office's estimate that the scuttled proposal would have increased the number of uninsured Americans by 24 million by 2026. "We are concerned the number of uninsured patients and both uncompensated care and bad debt (would) rise significantly," he writes. "Hospitals have more bad debt today and will continue to see more bad debt" if a Republican healthcare bill ever passes that guts Medicaid, says Bruce Haupt, CEO of ClearBalance, a San Diego company that works with hospitals to establish no-interest payment plans for patients. It's not just struggling Americans who are letting bills pile up. 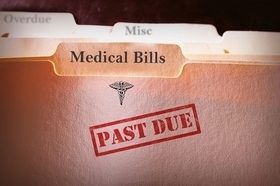 Wealthier patients are failing to pay up, too, due in part to the headache-inducing tango between insurance companies and providers and the resulting confusion around medical billing. "Hospitals have always been paid by third-party insurers and have been very weak historically at collecting the rest," says Venanzio Arquilla, who leads the healthcare practice at Claro Group, a financial management consultancy in Chicago. "A typical patient gets their mail stack, sees a bill from MasterCard or Visa with a clear due date and sees a hospital bill that says, 'You may owe $2,000 but don't pay it yet—this is not a bill,' because you have to wait for insurance to pay out. The Visa bill gets paid first and the hospital bill goes to the bottom of the pile." Hospitals have reacted by taking matters into their own hands, increasing internal billing staff, proactively contacting patients to set up payment plans and selling past-due accounts to bill collectors. In fact, hospitals are working overtime to get money from patients, says Arquilla, who has hospital clients in 45 states. "Hospitals have gotten much more aggressive in trying to collect at time of service, because their ability to collect on self-pay amounts decreases significantly when the patient leaves the building. You can't say, 'Give me your credit card' to someone in the emergency room bleeding from a gunshot wound, but you can to someone going in for an elective procedure." Hospital execs need not look far for a cautionary tale about getting too forceful: Six years ago, Chicago's Accretive Health, a medical debt collector, was a high-flying public company with stock trading at $30 a share. But it crashed and burned after the Minnesota attorney general filed suit against it in 2011 for such practices as soliciting payments from patients in emergency room beds. Today, under new leadership, Accretive has started over and has a new name, R1 RCM. At Northwestern Memorial, it has paid off to better communicate all the options to patients. The Streeterville hospital system reported a nearly 6% decline in uncollectible debt in 2016, to $154.9 million. Spokesman Chris King attributes the decrease to improvements in revenue cycle management and "enhanced engagement between our financial counselors and patients to improve access to our financial assistance programs." Meanwhile, patient education and advocacy is a growing cottage industry as high-deductible plans leave more consumers stuck with triple- and quadruple-digit bills—and as hospitals ramp up efforts to collect what they're owed. "Hospitals are . . . desperate," says Teri Dreher, a longtime nurse who founded Chicago-based NShore Patient Advocates in 2011. As independent patient representatives, Dreher and her team of eight nurses do everything from accompanying her clients to doctor appointments to deciphering and contesting bills. She says that while hospitals frequently call patients to set up payment plans, the callers are low-level customer service representatives who have no power to deal with bill discrepancies or bigger concerns. "The hospitals are actually putting more barriers between billing and consumers," Dreher says. "Five years ago, you could walk in and talk to a billing expert, explain your situation and have a little bit of leverage to negotiate your bill down." Not anymore. Haupt of ClearBalance says some hospitals are doing a better job of creating comprehensive loan programs that let people pay their bills over time. Such plans lead to more recouped revenue for the hospital, he says. When old accounts are sent to debt collectors, hospitals recover only a tiny fraction—in the low single-digit percentages—of the bill. ClearBalance does not currently work with Illinois hospitals but is meeting with one major network to establish a program. At Advocate, Szandzik says additional financial counselors and grants from pharmaceutical companies and charitable foundations help mitigate patient bills. He says sending a bill to collections is done only after "thorough review." That's another cottage industry that's profiting off the trend. Patient advocates say they increasingly have to deal with collection agencies such as Van Ru Credit Corp., a Des Plaines-based debt collector. Van Ru, which did not respond to a request for comment, was previously in the business of collections for student loans—a practice for which it received complaints, according to a spokeswoman for the attorney general's office. Now it's in the business of medical collections. "Feel like the hospital is shaking you down over that bill? It probably is." originally appeared in Crain's Chicago Business.